Shortly after moving in, the new owner of this 1950's-era ranch observed heavy efflorescence on the exposed brick chimney shaft in his living room and on the adjacent ceiling. A new roof had just been installed by a reputable contractor (Warner Nelson at Star Roofing & Siding) so we knew the roof was not the culprit. The new owner had been told that the rebuilt chimney was about a decade old (that's considered a young chimney by our standards), so we popped up onto the roof to have a better look. A close-up inspection revealed a concrete chimney cap cracked in multiple places and very poor mortar adhesion between the bricks (this can happen when ambient temperatures during construction are too high so the mortar dries too rapidly, when the mortar freezes before it has completely cured, or when the mortar has not been mixed correctly). After we removed the roof flashing at the base of the chimney, we were surprised at the extent of the brick erosion and failed mortar. We used Belden bricks (some of the best clay pits in America are located in Belden, Ohio). These Belden Colony Red Range bricks are more than double the cost of similar looking bricks but will last for generations…the way all bricks should perform. An added benefit was the spot-on color match with the brick facade which the new owner appreciated. We used only Type N mortar, which provided the right balance between strength and softness so that the bricks will not spall or crack apart prematurely. We saved the owner the cost of replacing the metal rain caps because they were in structurally sound condition and could be re-used. 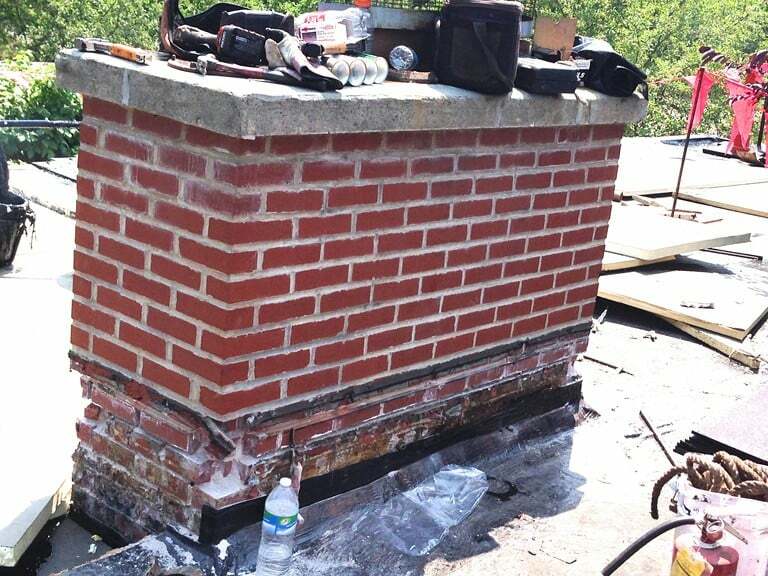 We cleaned up the job site and removed all traces of debris so that the roofer could return to permanently re-flash the base of the chimney using modified roof flashing and galvanized counter-flashing. 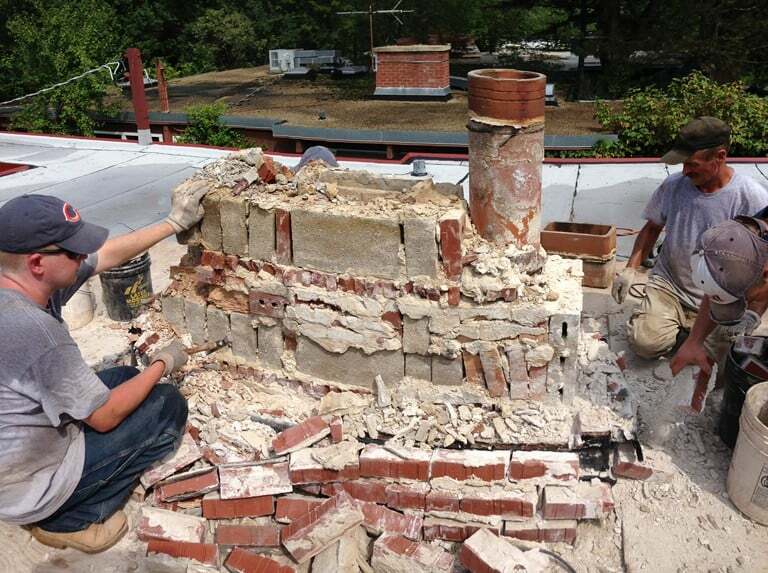 Whether your project is a residential chimney or a mile of parapet wall rebuild, we treat every job with respect and care. 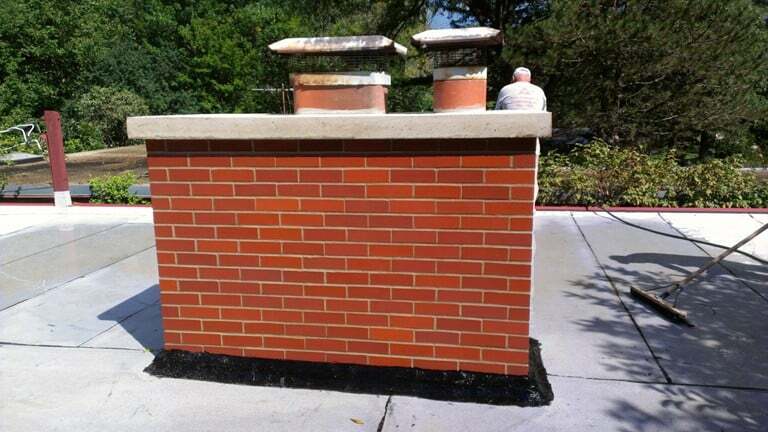 Exactly what you should expect from a masonry restoration company in continuous operation for over 60 years.